How important is nature conservation to you personally? The original task of nature conservation to protect valuable areas and species has expanded over time, together with the awareness of people in general. In the past decade the biodiversity conservation has been given a prominent place in nature conservation work. But is this reflected in the opinions of people living in and around rewilding areas? 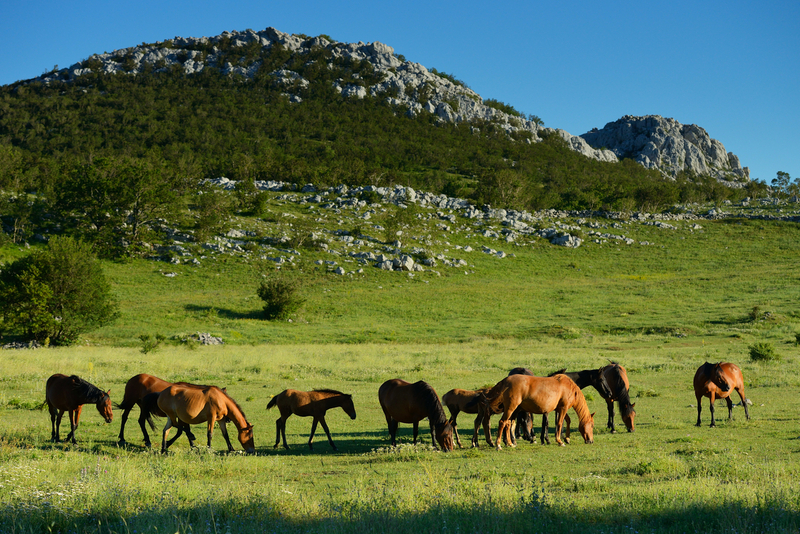 After several years of rewilding activities in Velebit, we wanted to see how important the local inhabitants consider topics like nature conservation, protection of wildlife, existence of wild and natural areas without intensive human management and other rewilding activities. In order to get the most out of the results the Rewilding Velebit team decided to implement the wildlife and wilderness survey on our own. After making a short population analysis we set the desired number of filled surveys filled to be 300 or more. An ambitious goal! It became apparent that this challenge was a bit too much for one person, so I managed to inspire a friend of mine, Ms. Tania Lugomer Popmper, to become a short term volunteer of Rewilding Europe and help me implement the survey. The second volunteer was my husband Tihomir Abraham, who grabbed the opportunity to join me on the field and to finally see for himself all of the wonderful places I have spoken about for so many months. Both of them are Croats who – can you imagine! – have never visited Velebit and we were all very keen and excited about the upcoming trip. Although it was November, we hoped for a good weather but were prepared for cold as well. During our three day visit to the area we had experienced the chilling bora wind around Senj, so strong that it was difficult to even open the car doors, snow covered the off-road mountain areas, a warm sunny morning in coastal Starigrad Paklenica, a heavy rain in Gospic and a hail in Otocac. This is something specific for the Velebit area, you can enjoy several climate areas in only one day: visit the mountain peaks in the morning and then go for a meal at the Adriatic coast in the evening. We had divided the area into five small zones where we visited more than ten towns and villages and the difference in opinions was quite interesting. While the people in the coastal areas were very willing to fill out the survey and enter discussions about nature conservation, the population in the interior was more reluctant. In the coastal towns of Senj and Starigrad Paklenica the awareness of local people about the Rewilding Velebit activities was pretty high, together with the interest of people for wildlife and nature conservation. 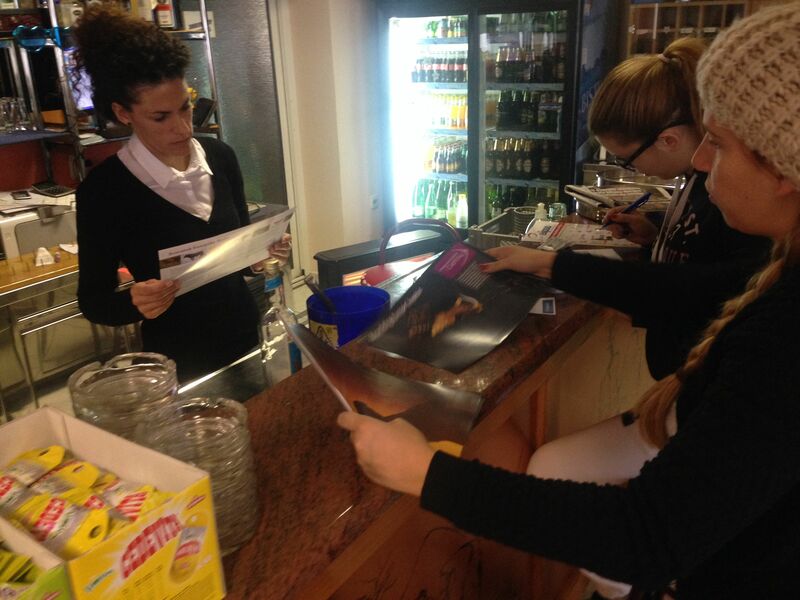 “If this is a survey with the topic of nature conservation I agree in advance with all of the questions and you have my full support,” said the owner of a small shop in Starigrad Paklenica. Maybe this is due to the fact that both of the small cities are in proximity of entrances to the national parks and nature based tourism is highly represented in the areas. The people in these towns were more willing to answer the survey and engaged quickly into discussions about the topic. After the interview they were interested in Rewilding Europe and happy to receive rewilding promotional materials. Conducting the wildlife and wilderness survey in Velebit. There is a factual difference in the mentality of people living at the coast and in the interior behind the mountains (Gospic, Otocac, Perusic), this difference was evident throughout the interviews and also slightly visible in the results. The analysis of the results gave us a better understanding of the situation and it is now clear where the communication activities have to be increased and to what extent. We also interviewed the Head of the Tourist Community of the city of Gospic. It was not just an interview and a talk. We agreed to cooperate with the tourist community of this county more actively by participating in the local events. There are plenty of opportunities for rewilding to come closer to people! An elderly man in Gospic gave us some warm words of encouragement: “Just be persistent. I warmly welcome all of your activities and appreciate your hard work, it would be great if more people join the nature cause.”. Spending several days in the area and talking with many people we got the opportunity to observe the connection of local knowledge and cultural heritage with socio-economic factors and an opportunity to work with live information through the collection of data that really did create added value. We have met people from different backgrounds, age and occupations and the most surprising fact of the matter was the opinions of hunters who showed a great support for nature conservation activities in Velebit. The main outcomes of the survey showed that the large majority of people supports our efforts to increase the number of endangered native and original wild animal species across Europe, actions for de-domestication of large grass-eaters from the original native species being allowed to live independently and free in the wilderness. Around 60% of people are familiar with the aurochs. Also, principally people do agree with the release of wildlife into this area to rise the number of wildlife to more historical and natural levels. On the other hand, people are not aware of the opportunities of providing investment loans to local businesses that make use of the economic values offered by wild nature and rewilding. They are not that familiar with nature conservation organisations which are active in the Velebit area, except the national parks, nevertheless Rewilding Europe is recognised with its most rewilding activities: the Tauros Breeding Programme, the Wild Horse Programme, and with the active Rewilding Europe Capital loan beneficiaries. The interviewed people demonstrated genuine interest in Rewilding Europe current activities and we believe their support will prevail in the future rewilding moves in the Velebit area as a result of our work. We hope to see this in the second survey which is planned in the future.